An Omnibus for the Omnivore! This is only going to run for a couple of days, so look sharp! As Bookbub readers already know, I’ve marked down The Chaos Chronicles, Books 1-3, to the ridiculously low price of $1.99 in all major ebook stores! That’s three full novels in collector-quality DRM-free ebook binding for less than the price of a decent chocolate bar! Neptune Crossing, Strange Attractors, and The Infinite Sea, all in one volume. It would make a terrific Christmas, Hanukah, or Solstice present for that e-reading loved one! This really will end soon, so don’t wait. And please, if you like it, consider posting an unbiased review at Amazon, or Goodreads, or any of the other stores! You have no idea how important those reviews can be. Thanks in advance! Update: I’m happy to say that this sale is going very well! Thanks to everyone who bought a copy or passed on the word! Day After Thanksgiving, on Neptune! So please — go out and make me grateful, people! Thanks! *Actually the Bookbub promo email went out yesterday, but it seemed crass to blog about a promotion on Thanksgiving Day. I hope you had a great one. I just learned of this: Downpour.com, the outlet store for Blackstone Audio, is running a huge Thanksgiving week sale, with 50% off on audiobook CDs, and it looks like 40-60% off on downloads! I’m not sure, but I think it applies to all their audiobooks. If you’re a fan of the format, this looks like a fantastic deal. My own Neptune Crossing is 50% off the CD and 60% off downloads. (They also have an option to rent downloads.) I do not know how long this sale will last—I was told it’s a Black Friday sale, but it’s already going—so if you’re interested, don’t wait too long! After several failed attempts at putting The Chaos Chronicles into audio via podcast, I was metaphorically trapped and rudderless in the great clouds of Jupiter. I gave it a rest for a while. My focus returned to writing. Audiobooks took second place to ebooks. I joined Book View Café, a marvelous cooperative publishing venture of several dozen veteran authors, including some highly respected SF writers. It was a smart move. I was doing my ebooks in community now, not just on my own. And suddenly a path broke open in Jupiter’s clouds! In a remarkable breakthrough, a resourceful BVC member got us a distribution deal with Audible: We had a first-rate list of books, and they would make audiobooks of pretty much everything we offered them! They took my two short story collections, which was all I could offer at the time. I didn’t have the rights to my remaining books. I wondered if I could get just the unused audiobook rights back. I asked. And asked again. For two years. I was never told no, just that so and so was away, or on leave, or… silence. Finally, one day, word came through: They weren’t just reverting the audiobook rights of certain books; they were reverting all rights. The books were mine again, to do with as I pleased. Good-bye, Jupiter! BVC and Audible, here we come! And perhaps it would have been—if it hadn’t come two weeks too late. Audible had changed their policy. They would not be adding these books to their list. Nooooo! We were free of Jupiter, but on a slingshot trajectory into the endless void. My only option seemed to be to pay a narrator and do the book myself. But I didn’t have the time or money. I grew ever more discouraged, as all the planets we knew dwindled in our viewer. And then… something unexpected twinkled on the scanner: Skyboat Media, Stefan Rudnicki’s recording company. I already knew and loved Stefan’s work narrating other books. His voice is deep and resonant, with the gravitas and character of James Earl Jones. His name would have been at the top of my request list. But there was no way I could afford to hire him and make an audiobook on my own dime. Eventually, I set aside my discouragement and sent Stefan an email: Would you be interested in looking at a couple of my books and telling me what you think? To my delight, he got back to me right away. He was interested. I sent him some ebooks. And a week later, I had his answer: He loved Neptune Crossing and wanted to narrate it. I could hear the enthusiasm in his voice. Further, he was offering a publication deal, with a modest advance and distribution through Blackstone Audio, a giant in the field. It would be in Audible and iTunes, as well—and all with one of my favorite narrators lending his voice to the story! Did I mention that Stefan is a Grammy and Hugo winner for his narrations? I did not have to think for longer than it took to pinch myself. The deal was struck, and soon Stefan was at work recording. And now the audiobook of Neptune Crossing is finished, and is live in all the major places where audiobooks are sold! And you know what? This time, it is great! If you like audiobooks, I hope you’ll give it a try. If you’ve never tried an audiobook before, I can’t think of a better place to start. If this goes well, the rest of the series will likely follow! Today marks launch day for the audiobook of Neptune Crossing! Narrated by the Grammy-winning Stefan Rudnicki! I feel as if I’ve just discovered a planet. Or maybe traveled to one. 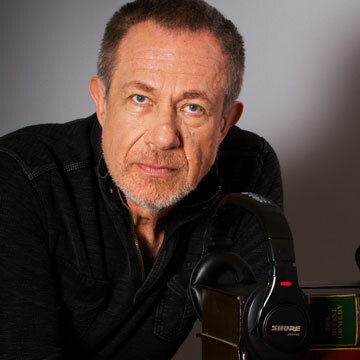 It’s been a long journey—and I often thought there would be no audiobook at all. 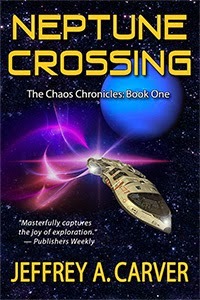 Neptune Crossing is one of my best known works, and the beginning of my most ambitious series, The Chaos Chronicles. But a thousand years or so ago, when I first sold the Chaos series to Tor Books, audiobooks were the furthest thing from my mind. They had not reached anything like the popularity they enjoy today, and Audible, iTunes, and library downloads were just a futurist’s dream. Only top-selling books got the audio treatment, and while I had my appreciative and loyal audience, I simply did not fit that profile. Time passed, and publishing changed. Indie-publishing happened. I started creating ebooks of my older titles, breathing new life into books long out of print. And I discovered audiobooks myself. What’s this? You can download audiobooks from the library? I loaded up my trusty Zune and started listening to books while I walked the dog. What a discovery! But why weren’t my books available? I cast about for ideas. Some of my colleagues—Jim Kelly, for example—were building their audiences through podcast readings of their own work. I could do that, couldn’t I? I thought I was a pretty good reader. Okay, I had no studio, limited experience, and only a cheap computer mic. But I gave it a shot. I recorded the prologue to the forthcoming Sunborn. Once again, I was left in the wilderness, with no clear road to audio for the Chaos books. Or, to pursue the planetary metaphor, I was adrift in the asteroid belt, thrusters sputtering. My agent eventually sold some of my other titles to Audible. But I didn’t have the rights to The Chaos Chronicles. None of this went unnoticed by my wife Allysen, who had worked in TV production. In 2011, she decided it was time to step up. We found inspiration in Bruce Coville’s Full Cast Audio, whose productions we had been enjoying as family entertainment. We would start at the beginning and create a full-cast amateur podcast of Neptune Crossing, to put online for free, using local talent! In our suburb of Boston, you can’t throw a rock without hitting a writer, artist, or actor. We put out the call. And people came forth—people with talent and enthusiasm, and willingness to help. One of them, Bob Kuhn, even had book narration experience. We bought a decent recorder, borrowed a bunch of sound curtains, and turned our living room into a Saturday afternoon recording studio. Allysen directed, and I took the part of Bandicut. Sam played the quarx, Peter and John each took several characters, as did Judy, Lisa, and Allysen. Bob laid down the narration track. Others came in for shorter parts. We got most of the book in the can, as raw recording. We began logging takes. And then… Allysen got a new job, a demanding one. Someone else’s work schedule changed, making Saturdays a problem. We were running ourselves ragged. It was taking a toll on my writing. I undertook the sound editing… and rediscovered just how time consuming that job was. Finally we called a hiatus. I had a book to write! Allysen needed to focus on her new job. The hiatus stretched. It was maybe a year before we realized that this project, too, was something we could not finish, not now, not without killing ourselves. We’d gotten out of the asteroid belt, only to be trapped, adrift and blind, in the clouds of Jupiter. Or Stefan Rudnicki’s interview with me. Skyboat Media has just posted a conversation I had via Skype with Stefan Rudnicki, the narrator of the forthcoming audiobook of Neptune Crossing. Stefan asks me some questions about how I wrote the book, and how I write in general, and I did my best to answer. Technical glitches prevented this from being a video interview, but I probably look better in your imagination, anyway! Video Trailer for Neptune Crossing Audiobook! Speaking of video, I did a Skype video interview with Stefan today, which was great fun—actually our first “face to face” meeting, if you count videophone as face to face. I hope we get a chance to meet in person one of these days. I’ll let you know when that interview goes up. 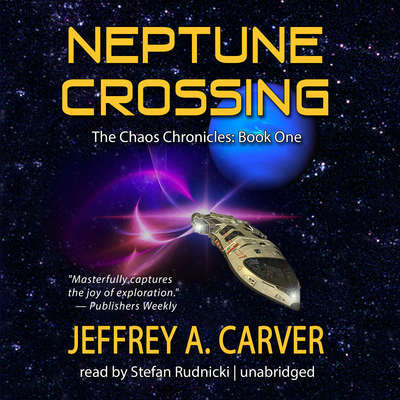 The soon-to-be-released audiobook of Neptune Crossing, narrated by the marvelous Stefan Rudnicki, is now available for pre-order on Amazon (CD version) and Downpour.com (Blackstone Audio’s downloads store). Libraries can pre-order the library CD. This is an important release for me, because if it sells well, they’ll probably go on to do the rest of the Chaos books. But that’s an important “if.” I’d love it if you could share and otherwise help spread the word! Thanks! According to an article in the Boston Globe, audiobooks are growing rapidly in popularity as more and more people—and I include myself—find them a wonderful way to read while walking, cooking, etc. I discovered the pleasure a few years ago, when I learned you could download audiobooks from the library and put them on your mobile device. I hope a lot of people do that with Neptune Crossing, and ask for more! Pre-order links are on the front page of my website at starrigger.net. If it’s something you plan to buy, I hope you’ll consider a pre-order. It can make a big difference at the launch! And in some cases, it can get you a preferred price, as well. Thanks again. I appreciate your support! Neptune Crossing Back in Print! A long time ago in a publishing house far, far away, my novel Neptune Crossing, Volume One of The Chaos Chronicles, was published by Tor Books. (Okay, Tor, now part of Macmillan USA, is in New York, which isn’t that far away.) The book has been out of print in paper for not quite as long, but long enough. Now it’s back—in a nice trade paperback—from my Starstream Publications imprint, in association with Book View Café! You can order it! You can buy it! You can give it away! For the moment, it’s available direct from CreateSpace, an Amazon company. Edit: And now it is available at Amazon.com. In a few days, it should become available at Amazon.com. I make a smidge more from selling it at CreateSpace, but do what works best for you. Can you get it in time for Christmas? I honestly don’t know. I ordered copies from my publisher account, and they will not be here in time for Christmas, but it might be different for regular customers. If you find out, let me know! Edit: I think it’s possible, if you order from Amazon. In the fullness of time, it will be available through other stores, as well, including (perhaps) your local bookstore. But that may take a while, and possibly a second printer/distributor. Time to get started on Strange Attractors. Maybe after New Years.